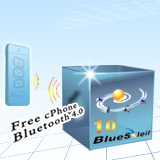 First, ensure that the Bluetooth headset or Bluetooth speaker connection is successful, as is shown in figure. 1. If you have the above-mentioned state, but still no voice , please refer to the following steps: Turn off the player, disconnect the Bluetooth connection, and re-establish a Bluetooth connection, then turn on the player. If can hear the sound in this step, Please note that you can turn the player to listen to music after connectting Bluetooth. 2. 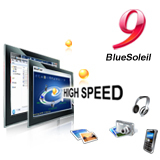 If the above step does not work, please restart the computer, then establish a Bluetooth connection, turn on the player. Through the above two steps still not work, please continue to following steps below. 3. 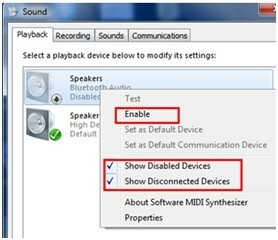 Win 7 OS : right click on the volume icon in the bottom right corner, click playback devices and recording devices (Control Panel-hardware and sound --manage audio devices), pops up a window, right-click show disabled devices and disconnected devices, If you have a Bluetooth Audio sound card, click Startup, and then set as default device. 4. 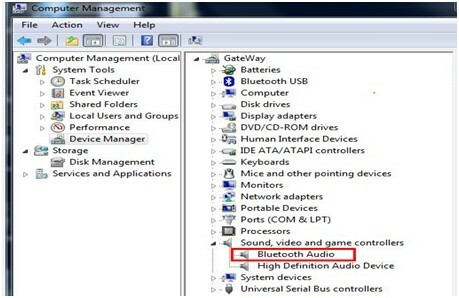 When the connection is successful, if there is no Bluetooth Audio device in the sounds and audio settings, look in Device Manager, if not, is the sound card failed to load. 5. If no Bluetooth Audio in sound settings, Run cmd.exe and type regedit, open the registry, search the following directory :HKEY_LOCAL_MACHINE\SYSTEM\CurrentControlSet\Services\, find BlueletSCOAudio and delete. 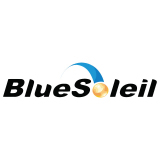 (Note: it looks similar to BlueletAudio, do not mistakenly deleted), after you close the registry, restart the computer. 6. 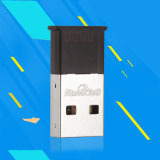 If the Bluetooth Audio is the current default sound card, headset can hear PC’s tone, but cannot hear the sound of music or videos, please restart the player. 7. If you still cannot, please reinstall the software, the installation is completed, follow the prompts to restart the computer.